From the publisher: Joe King Oliver was one of the NYPD’s finest investigators until, dispatched to arrest a well-heeled car thief, he was framed for assault by his enemies within the force, a charge that landed him at Rikers. A decade later, King is a private detective, running his agency with the help of his teenage daughter. Broken by the brutality he suffered and committed in equal measure behind bars, King leads a solitary life, his work and his daughter the only lights. When King receives a letter from a woman who admits she was paid to frame him years ago, he decides to take his own case: finding out who on the force wanted him disposed of—and why. As King embarks on his quest for the justice he was denied, he agrees to help a radical black journalist accused of killing two on-duty officers who had been abusing their badges to traffic in drugs and prostitutes in the city’s poorest neighborhoods. The two cases intertwine across the years, exposing a pattern of corruption and brutality wielded against the black men, women, and children whose lives the law destroyed. To solve them, King must outrun dirty cops, outsmart craven lawyers, and above all protect his daughter from the underworld in which he works. All the while, two lives hang in the balance: King’s client’s and his own. 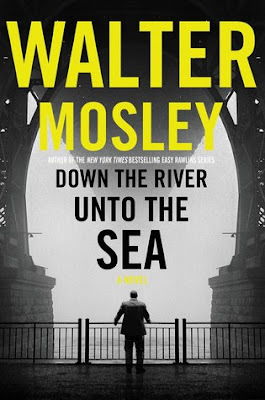 That experience colors everything that follows in this fascinating and, at times, horrifying novel from Walter Mosley, whose writing is always riveting. At this point in his life, the brightest and most beloved thing in Joe’s life is his seventeen-year-old daughter, Aja-Denise, who is equally devoted to him. Her mother, now Joe’s ex-wife, has remarried, but Joe is closer to Aja than ever; she helps him run his detective agency, where he is determined to find out who framed him. His daughter’s latest endeavor is to attend “a special school in this Bronx church where good science students teach at-risk kids how scientists do experiments.” Obviously, Joe couldn’t be more proud of her. I will leave it to the reader to discover all the other joys of Mr. Mosley’s writing for him/herself. The book is everything one has learned to expect from this author, and it is highly recommended. To enter to win a copy of Down the River Unto the Sea, simply email KRL at krlcontests@gmail[dot]com by replacing the [dot] with a period, and with the subject line “river,” or comment on this article. A winner will be chosen March 31, 2018. U.S. residents only. If entering via email please included your mailing address. Fabulous review of a fabulous book.